This morning I dropped an eyeshadow. I cringed as it smacked the hard tile floor, and stood there in denial for a few seconds. That did not just happen! I can’t tell you how frustrated I get every time I lose another makeup compact to gravity. Crossing my fingers that it survived the impact, I gingerly picked it up. But nope, the smooth, pressed powder was a shattered mess. I wish I had a nice wide counter space for all my makeup, but I don’t. I end up bumping makeup compacts off the sink quite a bit. Every time it happens, I get so mad at myself. If not for the fact that it was my third eyeshadow to bite the dust this week, I might have just done what I usually do and bought a new one. But this time, the frustration drove me to find a fix. Here are simple steps on how to repair your broken cosmetics. Whether you need to fix an eyeshadow, blush or any other type of pressed powder makeup, this little tutorial can save the day (and quite a bit of money)! 1. Your first step is to analyze the damage. If you drop a compact with the lid shut, you’re going to have more product left in there to work with. 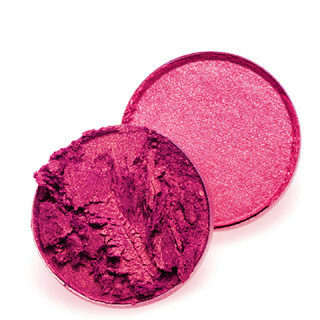 Turn the compact right side up and carefully open the lid while gently pushing any excess powder back into the makeup pan. If you dropped the compact while the lid was open, or if the lid popped open when it landed, you can pick up any bigger pieces that have fallen out and put them back in the pan. Carefully brush them off if needed before returning them to the compact. If you cracked the actual compact container, you’ll need a new one. You can find these at any major craft store or beauty supply store. They’re even often available at places like Target or Walmart. 2. Using a small spoon, cuticle stick or popsicle stick, gently break the makeup pieces into very small pieces. Continue by crushing the makeup into a powder. As you go, brush any makeup from the edge of the compact into the pan to ensure you use all available product. 3. Using an eyedropper, add one or two drops of rubbing alcohol to the powder. Be careful not to add too much at once. Mix the rubbing alcohol into the powder until well blended. Add another drop or two and mix again. Make sure the mixture is an even consistency after each addition of alcohol. You don’t want to have chunks left in the mixture, so blend well and evenly each time. Continue on until the mixture has a creamy, even consistency. Gently tap the container on your work surface to smooth out any remaining unevenness on the mixture’s surface. 4. Leaving the compact container lid open, let the mixture dry for a few hours. Depending on how big a compact you used, this could be anywhere from 2-5 hours. 5. Check the mixture after a couple hours. Once it is dry enough to touch, but still slightly damp, it is ready to press. You can test it by touching the top of the mixture. If only a little color comes off on your finger, then it is ready to go. If more comes off, or if your finger makes a big dent in the makeup, then you will need to give it a little more drying time. 6. Using a paper towel or napkin under your fingers, press down gently on the top of the mixture. Use gentle, even pressure, working your way around the edges and center of the pan. Gradually use slightly firmer pressure, gradually working your way around again. You can also opt to use a silver dollar or another hard, flat object over the paper towel to apply steady, firm pressure to the makeup compact. Be VERY careful not to push so hard or unevenly that you crack the makeup again (you will have to start the whole process over again if this happens, so be cautious during this step!) By gradually working your way up to firmer pressure, and making sure to press the entire pan evenly, you can avoid any mishaps. I also like to use cute, decorative paper towel prints or other objects to give my makeup a fun, patterned finish. Be creative and let us know what other patterns or ideas you come up with! 7. Once pressed, let the makeup continue to dry for at least 24 hours before you use it. Once dry, you will want to clean up the compact a bit. Spray a tissue or paper towel with multi-purpose cleaner and wipe down the outside of the compact as well as the inside cover and edges of the container. Congratulations, you are now the proud, new owner of a brand new(ish) makeup compact. I love this!! Thanks for sharing! So many lost eye shadows ! thanks for the tip! I’ll be pinning this for the next time this happens! It s better for me to know if a makeup brokes! hate when I drop my make up and it breaks! Hope it doesn’t happen again but if it does I’m definitely going to try this! 🙂 Thanks! You’re welcome Lindsay! Hope it comes in handy if it ever happens again! Thank you for sharing this with us! I will use this if it ever happens. Thank you for sharing all this great information!! This is great information to have. Thank you so much for sharing it with us. Wow I had no idea you could do this. Thanks! I love this…this has happened to me so many times as I’m a total klutz! Thanks for the tip! I tried this and I was able to fix a broken makeup. I would have normally thrown it away. Thank you for sharing. Definitely pinning this for future use! thanks! This is great! I can save a bunch of eyeshadows that got damaged when I moved. I agree. Save the powder it goes a long way. I have a bunch of broken eye shadows I was about to toss when I saw this blog! Saved me! It”s very interesting. Thanks for the tip! This is good to know for the next time I break a pressed powder. I have used this technique before and it truly does work. A nice save. ADOREI A DICA DE COMO CORRIGIR A MAQUIAGEM QUEBRADA! Wow! Thanks for great idea! I use a pill crusher to make sure there is no clumps then you have a nice smooth powder to repack the blush or eye shadow or I save empty little jars from little face creams,ect… and can use them as a loose powder as blush or eye shadow. I almost preferred the loose powder it is easier to apply. I have tried this lovely amazing trick and have saved an expensive blush that was broken.Thank you again for this awesome post. Thanks for this tip. This would save me money as I always drop one or it’s too shaken up in my purse. Will try for sure! Thanks! This is going to be a big help! this was so helpful! Keep up with the amazing posts! Wow, what a need tip. Where was this post 20 years ago. I have thrown away so many “broken” makeup product. I have tried to use it but once it is broken into chunks it never seemed to spread on properly. I will be using this trick for sure! What a great DIY fix! This little trick saved a blush that was a gift. I was SO relieved!